Artist talk II: Thomas Mass with Annette Tietenberg and Meike Behm. Step through the doors of the large, bright Kunsthalle Lingen – and into a visually stunning world. 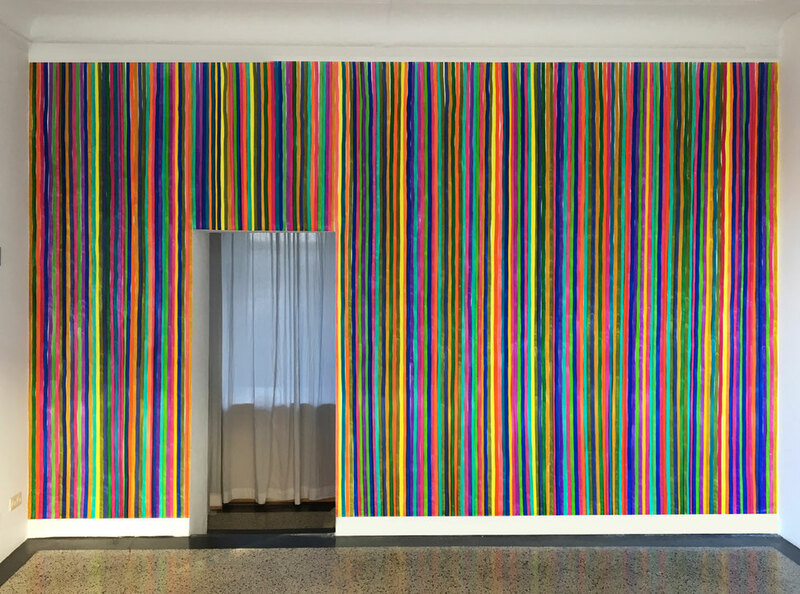 Where once rail engines were maintained or repaired and the Kunstverein now resides you’re greeted by a striking dividing wall from which a monumental pattern confronts you, courtesy of Thomas Bayrle. Bayrle has created an homage to the paintings of his fellow artist Michel Majerus (who died in a plane crash in 2002) in the shape of a wild and vibrant wallpaper pattern. Bayrle, who for many years taught at Frankfurt’s Städel Academy and last year caused such a stir at Documenta 13 with his superstructures and engines that rotated around themselves or inside themselves, has opted to vary his customary approach. Usually, he gives his themes a new speed of their own, leaves them to respond to themselves, and at the end captures it all by bringing the theme up against itself at the next-highest level of the structure. Be it shoes, buttons or camels, be it workers, cups or shoes, be it airplanes, soldiers or Maos or Willy Brandts – always the one image rubs shoulders with the next, duplicates it, expands and multiplies, until so many of the forever identical symbols have accumulated that the surface becomes too small for them, the eye is overwhelmed and your storage system inundated.